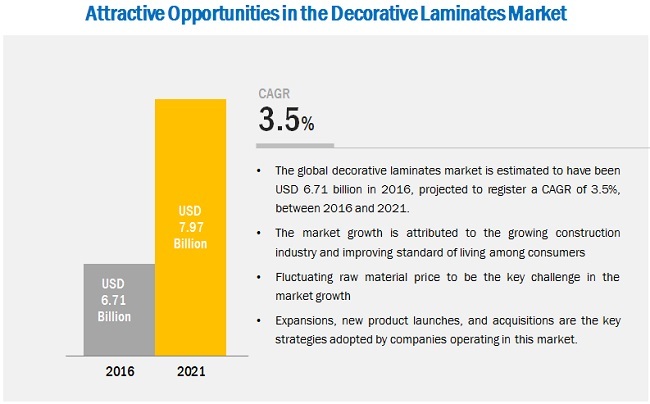 [130 Pages Report] The Global size of the Decorative Laminates Market is estimated to reach USD 7.97 Billion by 2021, at a CAGR of 3.5% between 2016 and 2021. The main objective of the study is to define, describe, and forecast the decorative laminates market on the basis of raw material, type, application, end-use sector, and region. The report includes a detailed information about the major factors (drivers, opportunities, restraints, and industry specific challenges) influencing the growth of the market. The report strategically analyzes the market segments with respect to individual growth trends, growth prospects, and contribution to the total market. The report includes analysis of the decorative laminates market on the basis of raw material (plastic resins, overlays, adhesives, and wood substrates), type (general purpose, post forming, special products, and backer), application (cabinets, furniture, flooring, tabletop, countertop, and wall panels), end-use sector (residential, non-residential, and transportation), and by region (Asia-Pacific, Europe, North America, Middle East & Africa, South America). The market size of decorative laminates has been estimated, in terms value. The base year considered for the study is 2015 while the forecast period is between 2016 and 2021. The decorative laminates market is driven by its low maintenance and installation cost coupled with the increasing growth of the construction industry. Both, top-down and bottom-up approaches have been used to estimate and validate the size of the global decorative laminates market and to estimate the size of various other dependent submarkets. extensive secondary sources, directories, and databases such as hoovers, bloomberg, chemical weekly, factiva, composite panel association (CPA), world bank, securities and exchange commission (SEC), and other government and private websites are involved to identify and collect information useful for this technical, market-oriented, and commercial study of the decorative laminates market. 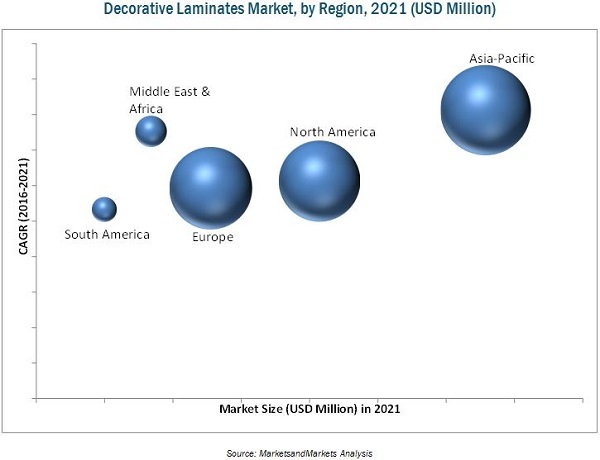 Some of the major market players active in the global decorative laminates market include Fletcher Building Limited (New Zealand), Omnova Solutions Incorporation (U.S.), Greenlam Industries Limited (India), Merino Group (India), Wilsonart International Inc. (U.S.), Abet Laminati S.p.A. (Italy), Archidply Industries Limited (India), FunderMax Gmbh (Austria), Panolam Industries International, Inc. (U.S.), and Stylam Industries Limited (India). This research report categorizes the global decorative laminates market on the basis of raw material, type, application, end-use sector, and region. The market is further analyzed for the key countries in each of these regions. The global decorative laminates market is estimated to reach USD 7.97 Billion by 2021, at a CAGR of 3.5% from 2016 to 2021. The decorative laminates market has witnessed significant growth in recent years. Decorative laminates, due to their excellent properties, such as water resistance, huge variety, durability, microbe-resistant, and ease of maintenance are used in a wide range of applications such as cabinets, furniture, countertops, and wall panels. These are the main applications that have been considered in this report. The main types of decorative laminates are general purpose, postforming, backer, and special products. Based on type, the general purpose segment led the decorative laminates market in 2016, due to the use of general purpose decorative laminates in several applications. This segment is estimated to grow at the highest CAGR during the forecast period, due to the increasing adoption of general purpose type of decorative laminates in the residential sector, owing to their excellent properties and distinct varieties. The demand for general purpose decorative laminates is high in all regions due to its easy availability and high disposable income of consumers. Decorative laminates are used in various end-use sectors such as residential, non-residential, and transportation. Based on end-use sector, the non-residential segment is projected to lead the decorative laminates market during the forecast period. This is mainly due to high volume consumption of decorative laminates in non-residential buildings as compared to residential buildings. 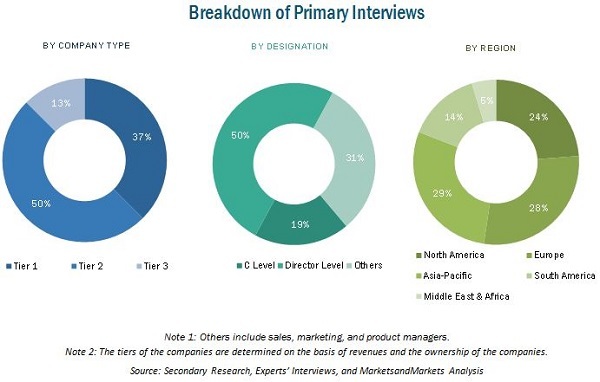 North America, Europe, Asia-Pacific, Middle East & Africa, and South America have been considered as key markets for decorative laminates in the report. Asia-Pacific is estimated to lead the decorative laminates market, owing to the rising demand for decorative laminates from residential and non-residential sectors. North America is the second-largest consumer of decorative laminates globally. In addition, increasing disposable income and rapid urbanization are fueling the demand for decorative laminates in various applications. The decorative laminates market is expected to witness significant growth in the coming years. However, factors such as fluctuating price of raw materials may hinder the growth of the market. Fletcher Building Limited (New Zealand), Omnova Solutions Incorporation (U.S.), Greenlam Industries Limited (India), Merino group (India), and Wilsonart International Inc. (U.S.) are the key companies operational in the decorative laminates market. Targeting new markets will enable decorative laminates manufacturers to overcome the effects of volatile economy, leading to a diversified business portfolio and increase in revenue. Other major manufacturers of decorative laminates are Abet Laminati S.p.A. (Italy), Archidply Industries Limited (India), FunderMax Gmbh (Europe), Panolam Industries International, Inc. (U.S.), and Stylam Industries Limited (India). 12.9 Panolam Industries International, Inc.